Sometimes good news can come at a bad time. The Sochi Olympics were sooo long ago right? But Under Armour is still feeling the icy sting of what should’ve been a shining moment for the company at a high-profile sporting event. Instead, it turned into an epic fail and a design flaw in the company’s new super suits were held responsible. Now Under Armour can enjoy a little vindication. An internal investigation finds that a big part of the US team’s problems stemmed from timing. Athletes got the suits too late to thoroughly train in them. Moreover, the training they did was in Italy at high altitudes and outdoors. The Sochi competitions were held indoors at sea level. There was even an issue with some new skate polish athletes were given. Once the competitors started losing, they got frustrated and frustration begat further losses even when they went back to their old suits. The report also points out issues with too much travel for the athletes, etc. In the end, the team had its worst showing in three decades. So, whew! Not really Under Armour’s fault! Problem solved right? Eh. The Wall Street Journal, reporting on the story, couldn’t get a comment from Under Armour on the situation, likely because the company has got some other good news that they would rather focus on. Last week, the company got closer to overtaking Nike as the largest sporting apparel company in the world with the opening of its biggest store so far in New York City. “We’re not a one trick pony. We’re a multi-dimensional brand. We have a lot of growth in front of us. In fact, we have the opportunity to be the number one brand in the world,” Under Armour CEO Kevin Plank told CNBC. 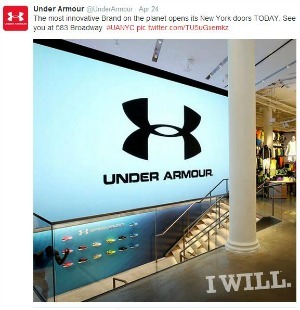 With that in mind, Under Armour may not want to revisit one of its low points. CNBC points out that CEO Plank is prone to talking up the scientific attributes of the company. In the case of the Sochi speedskating team, all of the scientific advancements to make the Mach 39 suits the best around were really for naught. And now, a couple of months after the close of the Games, all that people remember is that Under Armour was to blame for the poor results. The company has a contract with US Speedskating through the 2022 Games, so there’s time for Under Armour to redeem itself. In the meantime, the company is forced to kind of ignore this development in order to push it into the background.